BEND, OR -- Jamie McLeod Skinner, Democrat nominee for the Second Congressional District, says Congressman Greg Walden won't schedule a debate with her. The two discussed debates in person, and she has sent written invitations, but says Walden has yet to respond, "Seems like he's not the kind of guy who likes to compete. Despite that, he's using a kind of running out the clock strategy," McLeod Skinner tells KBND News. She's now scheduled to appear at several forums around the district, hosted by organizations she says would like to have debates. But, McLeod Skinner says if the Republican doesn't show, she'll take the opportunity to connect with voters. "We've responded and always said, 'name the date and the place, and I'll be there'." 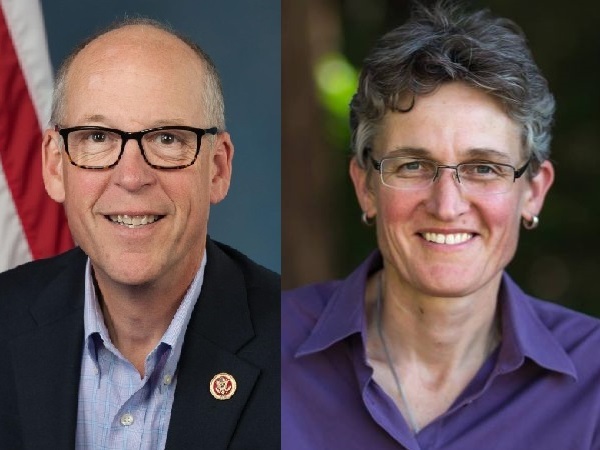 Congressman Walden says, "Right now, it's more about how she can get attention for herself by issuing challenges, claiming I'm going to be places I'm not going to be. That's the California brand of politics she's brought with her." He tells KBND News he doesn't have time for those kinds of politics, "I also have a full-time job so I realize that if you have nothing else to do with your time but campaign, you can be anywhere anytime, but I take my job seriously, work hard at it, and get real results." Walden says campaigns are one long debate, but he intends to meet McLeod Skinner sometime soon. McLeod Skinner looks forward to the prospect, "Voters have the right and deserve to hear what their candidates think. If you're running for office, you need to show up, you need to earn people's votes." She adds, "We're hearing more and more people getting frustrated with his lack of availability. I think it's been over 500 days since he's held an actual open Town Hall. No one seems to be able to get ahold of Greg Walden these days." Former Combat Veteran Craig Jorgensen took part in last weekend's anti-Walden demonstration in downtown Bend. He believes debates are part of the democratic process, and he wants to see at least four across District Two, "It's the right thing to do. I want to hear both candidates give their opinions and tell us why they're running, and I think we're deprived if we don't have that debate." Walden was first elected to Congress in 1998. He faces McLeod Skinner and Independent candidate Mark Roberts in November.